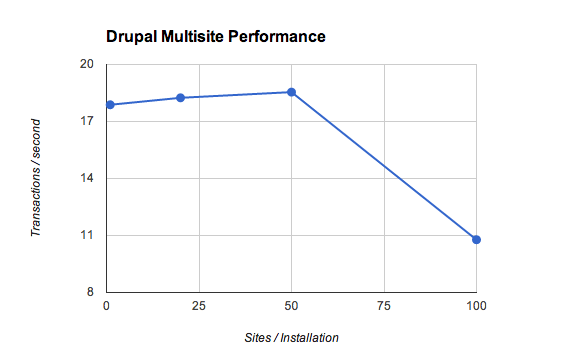 A while back I heard that Drupal performs badly on multi site (around 50 or so sites) environments. It made my wonder what exactly makes the difference. Basically, it's just a LAMP stack, and 50 site folders shouldn't make a significant difference. I decided to test it out... for the test I created a fresh Drupal 6.15 installation, and generated 1, 20, 50 and 100 sites within it. Each site containing 200 nodes (with paragraphs from H.G. Wells' War of the Worlds as content, thanks to Project Gutenberg). Each installation was hammered with 50 concurrent users each requesting 5 pages (with Siege, available in here). With 1-50 sites the performance has no difference what so ever. Most of the time is spent waiting for the database, so caching database objects is the easiest and probably most effective way to improve performance. After 50 sites my humble test machine runs out of memory so the ball is dropped pretty much immediately. The scripts I used for testing and generating are attached below.